This past Thursday Congressman Rob Woodall (GA-7) reintroduced HR-25, The FairTax Act of 2013, to the House of Representatives. See list of fifty-three original cosponsors for this bill below. The companion legislation will be reintroduced in the Senate on or after January 22. Those who have attended my FairTax seminars know I always end with the above quote from Margaret Mead (it applies to America & the signing of the Declaration Of Independence doesn't it) & start by presenting the FairTax in three steps. 1) The FairTax is the result of a $22 million study done over a three year period conducted by world renowned economic & legal scholars. 2) The FairTax itself is a bill in Congress - HR 25 in the House. 3) The FairTax Plan is a nonpartisan proposal that replaces all federal taxes on individual & business income, as well as payroll, estate, & capital gains taxes with a 23% (tax inclusive) national consumption tax on both personal & government consumption of new goods and all services in the U.S. The FairTax taxes only the final consumer or user in the U.S. of new goods & services meaning essentially it taxes retail sales & government consumption. The FairTax offers a solution to our economic problems that when implemented will bring fairness & prosperity back to our country & its citizens. 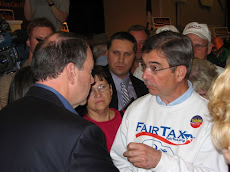 I believe that HR-25, The FairTax Act of 2013, is the most important piece of legislation in our lifetimes for America. The FairTax does not tax our productivity like the income tax does. It taxes both personal and government consumption of new goods and services in the U.S. It doesn't tax what goes into the economy but rather what comes out of it. The FairTax reverses the idea that our earnings first belong to the government & then, whatever is left, to us after withholding. Earnings under the FairTax belong first to the citizen in that our paychecks & pensions are received free of federal taxes - this turns every consumer into a concerned taxpaying stake holder. If you work, save, or invest you do not pay the FairTax – the individual consumer pays it only when they choose to buy new goods or any services @ the retail level. The FairTax includes a cash prebate that ensures no American pays federal taxes on their spending for essential goods & services up to the poverty level. The prebate equals 4% of the FairTax 23% rate meaning that if there was no prebate the FairTax rate would be 19%. Under the FairTax all of our products for export will travel overseas with no tax component - unlike now when a significant tax component is in every product that leaves our borders. This is one of the features of the FairTax that will help bring manufacturing jobs & plants back to America - the free market capitalistic system unfettered by government regulations & taxes. The American economy is screaming for the FairTax. The FairTax strengthens Social Security & Medicare by replacing the income base that currently funds these programs with a growing consumption base. As baby boomers retire @ the rate of 10,000 per day it can readily be seen that a system relying on an income base with a dwindling number of workers is inferior to one that relies on a consumption base that is twice the size of the income base. In addition to strengthening & preserving these programs under the FairTax legislation current Social Security benefits are indexed for any increase in prices because of the FairTax meaning that a senior couple could have anywhere from $50,000 to over $90,000 per year in consumption covered with no tax liability after enactment of the FairTax when taking the prebate & Social Security indexing into account. The taxing of the consumptions of federal, state, & local governments under the FairTax aids in controlling the expansion of government & helps confine governments to their sovereign functions thereby making sure we get as much government as we really need & want. All of the work consistently being done by the thousands of FairTax volunteers around the country – handing out pocket cards, writing letters to the editor, blogging, or appearing on radio & TV – are watering the seeds of awareness so that more congressional cosponsors will sign on. 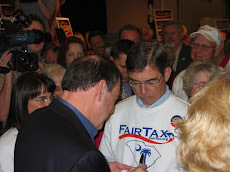 With this work expanding from one community & congressional district to the next the right presidential candidate will have the backing he needs in place to successfully promote the FairTax to the nation & into law. Please contrast the fiasco of the tax bill, where America lost again, negotiated on New Year's night to the tremendous improvements for funding our government & securing our liberties I presented above. It is easy to participate – start by telling your next door neighbor & best friend about the FairTax, place a FairTax bumper sticker on your car, & place a FairTax lawn sign outside your house. It all adds up & will make a difference. Click on The FairTax to learn more – there is a list of topics from the very basic to the most esoteric including Q & A from two workshops that address all of the above points in detail. Please contact me with any questions. If you want to learn the principles of the FairTax I will not be the reason that you don't. Thanks Doug - this is an excellent, well timed update. The Fair Tax will prioritize the much more productive private sector of our economy. Hence the odds of greater prosperity (ex back to periods of 3% to 5% GDP growth). Your site is best source of FT details. I forward your site in my blogs and tweets. Expect more reads and thus greater awareness. I read the RTE report on the reintroduction of the bill. Thanks for sending it. Your opening quote by Margaret Mead is one of my favorites. Doug - Thanks for the excellent article summarizing the important features of the Fair Tax. I need an explanation of "the prebate equals 4 % of the FairTax 23 % rate". I realize that if there is no prebate then the rate would be lower. A Happy & Blessed New Year to you and Carol! 11. How does the prebate compare with the income tax system's deductions, preferences, loopholes, credits, & favors. Wouldn't it be easier to just exempt items like food & medicine from the FairTax? What do you say to someone who asks if taxing food & medicine hurts the poor? The current income tax system doles out about $456 billion more to favored taxpayers then the prebate provides to everyone with a valid Social Security number in ensuring that no one pays tax on the cost of the basic necessitates of life. The prebate is estimated to cost $489 billion per year (about 4% of the 23% meaning that the FairTax rate would be 19% without the prebate.) Compare that with the $945 billion cost of income tax deductions, preferences, loopholes, credits, favors as estimated by Joint Committee on Taxation. The prebate is half the cost of the current system's deductions, preferences, loopholes, credits, & favors & unlike the latter treats all Americans equally. With regard to items like food & medicine Ken Hoagland has pointed out that "exempting items by category is neither fair nor simple. Respected economists have shown that the wealthy spend much more on unprepared food, clothing, housing, and medical care than do the poor. Exempting these goods, as many state sales taxes do, actually gives the wealthy a disproportionate benefit. Also, today these purchases are not exempted from federal taxation. The purchase of food, clothing, and medical services is made from after-income-tax and after-payroll-tax dollars, while their purchase price hides the cost of corporate taxes and private sector compliance costs. Finally, exempting one product or service, but not another, opens the door to the army of lobbyists and special interest groups that plague and distort our taxation system today. Those who have the money will send lobbyists to Washington to obtain special tax breaks in their own self-interest. This process causes unfair and inefficient distortions in our economy and must be stopped."